Printing is probably one of those aspects of computing that many people take for granted. Printers are a common standard now, for both businesses and homes, giving the ability for people to print out homework, maps, invitations, and even birthday cards. In the world of the desktop publisher or the graphic designer, printing is a bit more involved, as they need to pay close attention to the colors they use and how they reflect on the printed page. But how does this happen? Many people are aware of the types of printing cartridges they need to pick up (either that of black or color), but how exactly does the image that you've designed find its way onto that of the printed page? Here, we'll explore four color process printing. lithography. Lithography is the process of putting a print – or lithograph – on a hard flat surface. This was one of the first printing technologies since the invention of the printing press in the 15th century. The four color process is where the color within an image is divided into four separate values that are then transfered to a printing plate. This is procedure is known as color separation and includes these four colors – cyan (blue), yellow, magenta (pink-red), and black. Many people probably think that RGB – that is red, green, and blue – is a part of this process or that of the same family; however, there is a big difference. RGB color is what we typically find when we look at an image on our computer screens. However, this type of color does not transfer to the printed page, as it relies on light to be projected outwards in order to get the colors in the image that we see. This is where CMYK comes in. When we view something in CMYK, we're actually viewing light reflecting off of tiny little pigments of these colors, where the effects of different colors are achieved by either the angle or size of the CMYK dots. When CMYK is blended together, it makes the colors you see darker, where RGB is appears lighter when blended together. As a desktop publisher or graphic designer, developing a newsletter or document for yourself or that of a client, what you see on screen is actually different than what you will see when you print. As mentioned, RGB is what we are used to when we view images on a computer screen and even that of a TV screen. When you print from something from your computer to your printer or if you send artwork to a printing press company, the image is actually separated in four parts; the same image will then be colored first in black, then cyan, then magenta, and then the yellow ink. This is actually how many digital and web printing processes do their printing. Think of CMYK as an optical illusion, something to trick your eyes into seeing a full color picture. So how do you go about getting your prints in CMYK if they start out in RGB? And what about the common printer that you find in the store? Do you need special parts? Luckily, all of your concerns are easily taken care of for you – most of the software programs that utilize the use of images or printing will automatically turn RGB images into CMYK. Popular programs which graphic designers will use are easily able to switch from that of RGB to CMYK, such as many programs in the Adobe Creative Suite (Photoshop, Illustrator, InDesign). 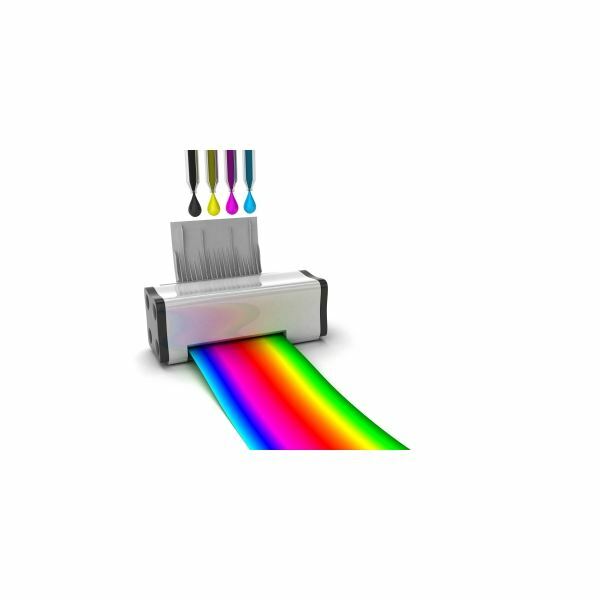 Printers too will automatically switch the RGB photo or image that you are viewing to that of CMYK. Depending on the printer of course, there may additional settings that you can play with or set. In dealing with the printing process, you may be surprised at what goes on when you take the image from your computer screen and transfer it to the printed page. And it's not just the home or even work where these processes are done; lithograph technology, for instance, is still being used and seen today, from the design of the local newspaper to that of your new business cards. Designers who work with images should be aware of how four color process works, as well as how it applies to their craft. Knowing about the underlying process helps to give prespective on what colors to use and how to go about getting that image on the printed page.